There were snowy, icy balls everywhere. 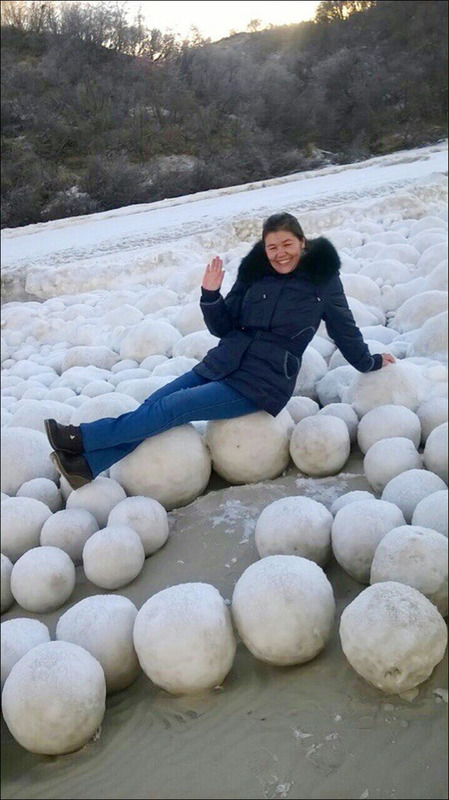 Videos and photos from western Siberia, on the Gulf of Ob, showed an entire beach covered in snowballs that had apparently washed ashore. In one image published online by the Siberian Times, a woman sat on the frozen balls. In another, a dog ran near the balls, which had also formed what looked like a vertical mass of balls mashed together into an icy ball-wall. The BBC reports that the balls started washing up about two weeks ago. They're strung along some 11 miles of coast and are said to range from about the size of a tennis ball up to almost 3 feet across. Here's a video of the beach shot by someone named Valery Togo, who told the Russian news site Vesti Yamal that he lives in the nearby town of Nyda, which is on the Yamal Peninsula just above the Arctic Circle.
" 'It can be such an original combination that it results in the formation of balls like these.' "
The Collins English Dictionary defines "slob ice" as "sludgy masses of floating ice" in Canadian English. Rare and original as the ball-forming process might be, this is not the first time humans have witnessed these globular creations. 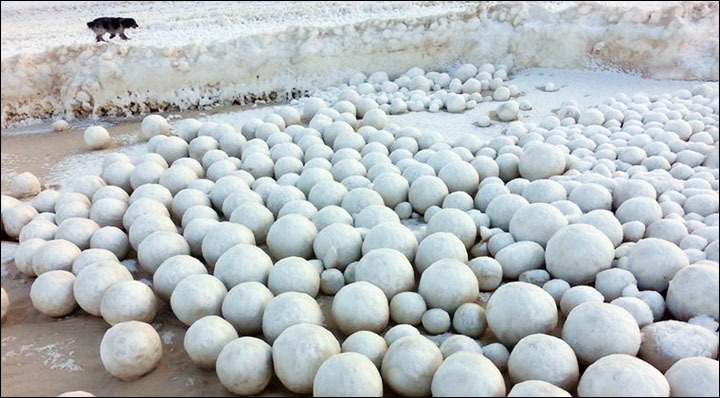 In 2010, a Chicago Tribune video showed snowballs that washed up along Lake Michigan.